South African born Neill Blomkamp was set to direct the big screen adaptation of the Halo video game under the auspices of producer Peter Lord Of The Rings Jackson. Some would say Halo got postponed fatefully, and led to this modestly budgeted, but highly original sci-fi laced movie, based on the Blomkamp short movie Alive In Jo'burg. An extraterrestrial race has found their way to earth, and in stead of heading for New York or London, their gigantic space craft comes to a stop over Johannesburg, South Africa. The malnourished and ill creatures inside are crammed get contained in an area known as District 9 - but after several decades, this area has become an uninhabitable slum, not only because there are very few services, but also because of the aliens' nature. Amid these haggard conditions, humans co-exist, also including Nigerian gangsters. Multi-National United (MNU) is contracted to sort out the problem, but they are more interested in the alien weaponry which humans are incapable of using. The MNU is a strange blend of Apartheid-era militants and current persuasions, and have to move the aliens (derogatorily referred to as “prawns”) from District 9 and repatriate them to refugee camps. Wicus Van De Merwe, an old-school government-style administration agent is put in charge with heading the operation to serve the “prawns” with eviction notices to vacate their shanties - a laborious door-to-door process with several spills resulting. During this operation Wicus is accidentally exposed to the aliens' biotechnology, not only altering him, but possibly the entire course of history for the aliens on earth. With the MNU out to experiment on Wicus, he escapes and finds himself on the other side of the fence, becoming an unlikely action hero (further bulking up the originality-cred of this highly impressive movie). Wicus is very well played by Sharlto Copley, even when his nerdy Afrikaans character often lapses into a caricature. Colloquialisms are littered across the movie, seeing and hearing them on the screen (often not subtitled) adding to the enjoyment for South African viewers. The first chapter of the movie is shot like a documentary in progress, but pretty much falls way when the teeth of story take hold. The South African movie industry has been marred in three sectors: the politically driven theme, cheap slapstick, and the advertising industry with foreign companies utilizing the country's locations, professional crews and cheaper cost. District 9 adds an entirely new dimension to the SA film industry. This highly original movie is another much needed breakthrough for the South African movie industry. Tsotsi won the Oscar for best foreign film, and Charlize Theron for best actress. District 9's contribution will be recognized for its leap from the well-trodden socio-political path by injecting (some) of these issues into a high profile special FX / sci-fi / action spectacle loaded with both entertainment value and a consciousness leaving the viewer with a lot to think about when it comes to the adage of "love they neighbour". The references to South African cases in District 9 is no secret (with the aliens ariving during the Apartheid era), from people forcibly removed from South African areas like District 6 (on the edge of Cape Town city), to the recent xenophobia around foreigners from Zimbabwe and other parts of Africa, being attacked by fellow Africans, referring to them as “cockroaches”. District 9 can be seen as the first true South African FX movie, it's realization and execution all home grown (except for the digital FX which was handled by Peter Jackson's Weta and other companies like animators that worked on Iron Man). With a special FX background, Blomkamp was responsible (amoung other things) for the Citroën advert, with the transforming & dancing car. 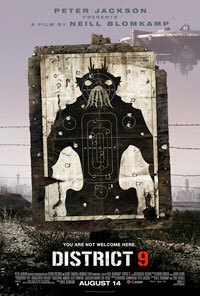 Gritty, exhilarating and very South African, District 9 is by far one of the most original movies this year. District 9 will release the same weekend as the first CELLUDROID Sci-Fi / Anime / Fantasy Film Festival at The Labia Theatre on Kloof Street, Cape Town, South Africa.